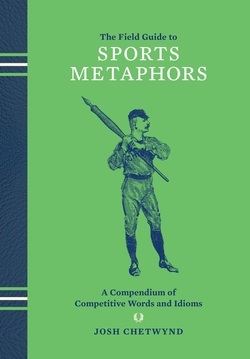 A Field Guide to Sports Metaphors - Doug Grad Literary Agency, Inc. The language of sports resonates beyond the grass and dirt of the local ball field because it is so evocative. The gridiron as a battlefield, the quarterback as the man in charge--these concepts slip seamlessly into the words of everyone from politicians to businesspeople. There are many metaphors we can quickly identify from the realm of recreation: ballpark figure (baseball), being caught flat footed (boxing) or having theinside track (horse racing) are all examples. But the English language is also peppered with not-so-obvious instances of sports and games influence like stymie (golf) and shoo-in(horse racing). Filled with pithy little entries on each idiom, plus quotes showing how the likes of President Barack Obama, President George W. Bush, and Donald Trump use them in a sentence, this quirky little handbook is sure to be a conversation starter at tailgates, cocktail parties, and in the boardroom. Josh Chetwynd is an award-winning journalist who has worked as a staff reporter for such publications as USA Today and U.S. News & World Report. He is a versatile writer, having contributed to numerous other outlets, including The Wall Street Journal, The Times (of London), the Harvard Negotiation Law Review and BBC Radio on topics as varied as sports, film, politics, legal issues and travel. He has written five books, receiving extensive critical acclaim for his efforts, including being dubbed “a great storyteller” by NPR. In particular, Chetwynd excels in writing about sports. His book The Secret History of Balls: The Stories Behind The Things We Love To Catch, Whack, Throw, Kick, Bounce and Bat (Perigee Books) was named a “Best Book of 2011” by NPR. It was labeled “essential trivia” by ESPN The Magazine and was called “[a] little gem of a book” by The Wall Street Journal. Before that, Baseball in Europe: A Country by Country History (McFarland & Co.), received plaudits from such publications as the Chicago Tribune (“fascinating”); The Guardian (UK) (“unrivaled in its description of baseball’s presence [in Europe]...definitive”); MLB.com (“comprehensive”); and Choice Magazine (“excellent…Highly recommended”). He also wrote, How the Hot Dog Found Its Bun: Accidental Discoveries and Unexpected Inspirations that Shape What We Eat and Drink (Globe Pequot 2012), and The Book of Nice: A Nice Book About Nice Things for Nice People (Workman, March 2013). In addition, he co-authored the book British Baseball and the West Ham Club: History of a 1930s Professional Team in East London. A Northwestern University graduate (along with former major league catcher and current New York Yankees manager Joe Girardi) with a Masters in Journalism, Chetwynd is a former NCAA Division I and minor league-level baseball player as well. You can visit his website at http://joshchetwynd.com/chetwynd/. He lives in Denver, Colorado, with his wife and two children.